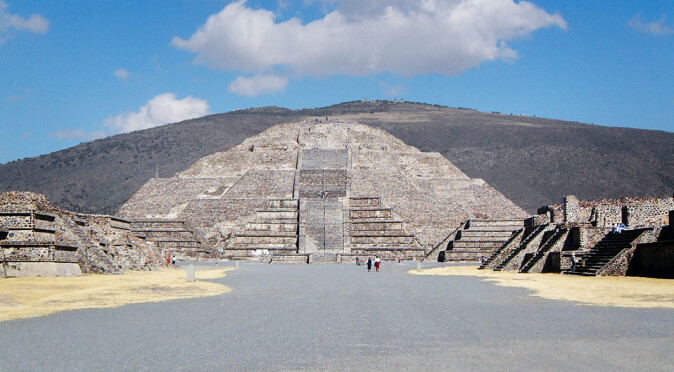 W3-0004: Great Goddess or Spider Woman The apartment compound of Tetitla is located 500m west of the Avenue of the Dead at Teotihuacan. 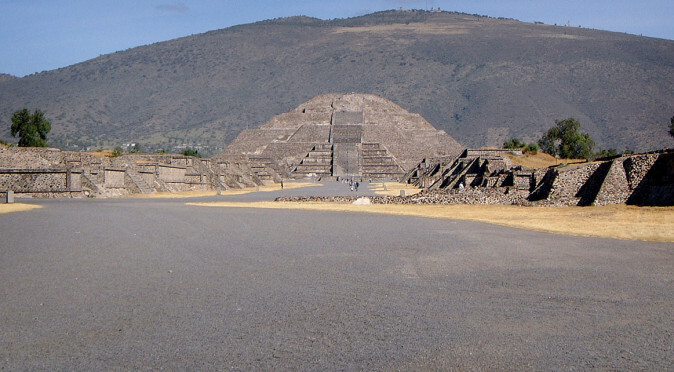 Tetitla features a number of fine mural paintings, including one of the Great Goddess who is also pictured in a similar apartment compound called Tepantitla. 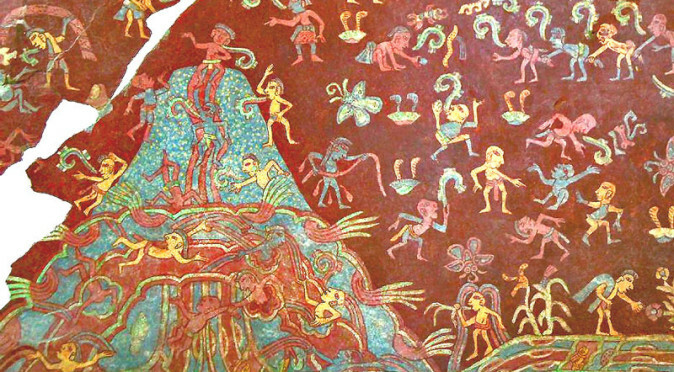 The mural of Tetitla shows the Great Goddess wearing a headdress that features an owl bordered by a snake (evident from the yellow and red triangular pattern, as well as a less obvious chevron-style scale symbolism). 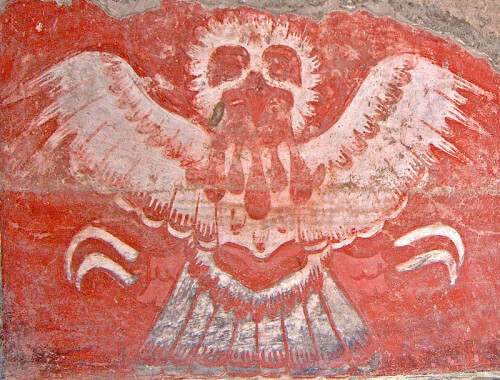 The owl wears an unusual nose-bar that features a number of teeth, which may have partly been intended to create a double-image, with the two circular motifs either side of the mouth being the eyes of another beast whose teeth are the nose-bar and whose nostrils are the owl’s beak. The unusual undulating pattern around these eyes could also be construed as snake symbolism. The owl’s tail and wing feathers fan out around the headdress, however this plumage doubles up as the foliage of a tree, with the trunk coming down beneath the headdress and around the Great Goddess’s head, doubling up as her hair and also designed to radiate like the rays of the sun. The Great Goddess also has a nose-bar with pendant “fangs”, which has led to her being dubbed the “Spider-Woman”. Around her neck, the undulating snake, zig-zag scales, triangular snake-skin pattern and feathers are repeated in the design of her robes. In her hands, the Great Goddess holds the hem of her robes, which cascade with a wave pattern and a number of other icons or glyphs within (these are mirrored on both sides). 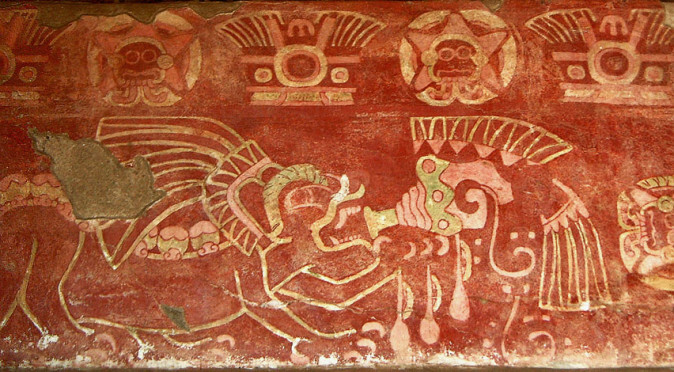 The most prominent theme is that of snakes and birds, commonly attributed to the feathered-serpent, although the additional symbolism of the tree and cascading waters suggests an all-encompassing “Great Goddess”. 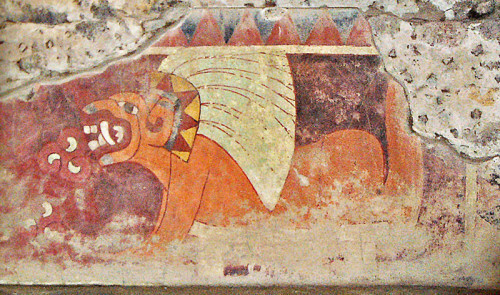 Jaguar MuralSome of the iconography of the Great Goddess is found again nearby on a mural of a jaguar. The jaguar wears a headdress that features the same plumes of feathers and the triangular snake-like pattern – again supplying the combination of a feathers and serpents. 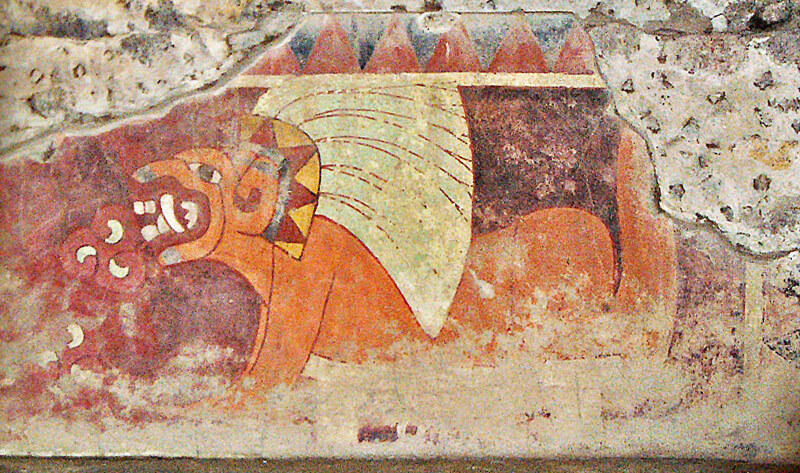 In its mouth, the Jaguar holds what is commonly believed to be the symbol for the heart, and there is another one on the floor beneath his mouth. This heart motif is commonly found in Mesoamerican writing, with an early example having been uncovered a San Jose Mogote, which dates between 750BC and 500BC. Barely legible beneath the jaguar is a long bench, on which he sits. 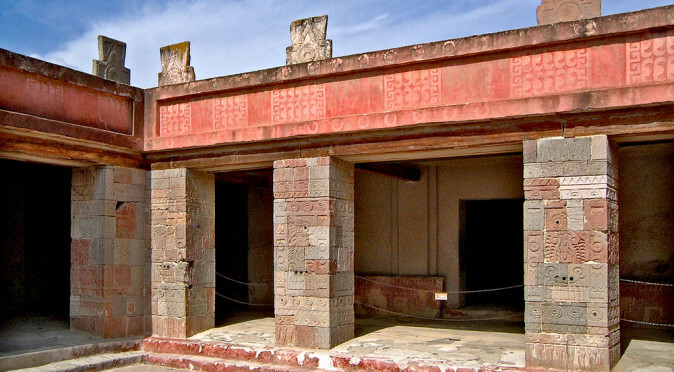 These long benches are considered to be thrones when found in the artwork of the Maya, and so it would appear this Jaguar is symbolic of a ruler and his conquests. 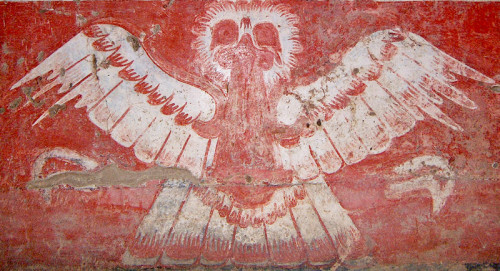 Also found in the compound of Tetitla are murals of birds. The roundness of the head and the fluffiness of its plumage suggests that they are owls rather than the more commonly found images of eagles and hawks. The birds have blood dripping from their beaks, which suggests they may be a symbol of war or a coat-of-arms for a warrior-clan. 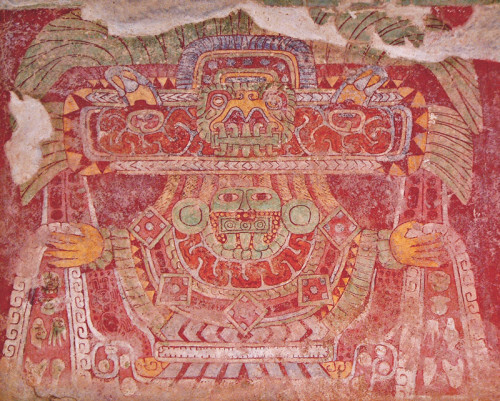 Glyphs and stelae featuring warrior-owl imagery have been found at Tikal along with references to a Great Lord of the West, who has been subsequently named as “Spear-thrower-owl”. 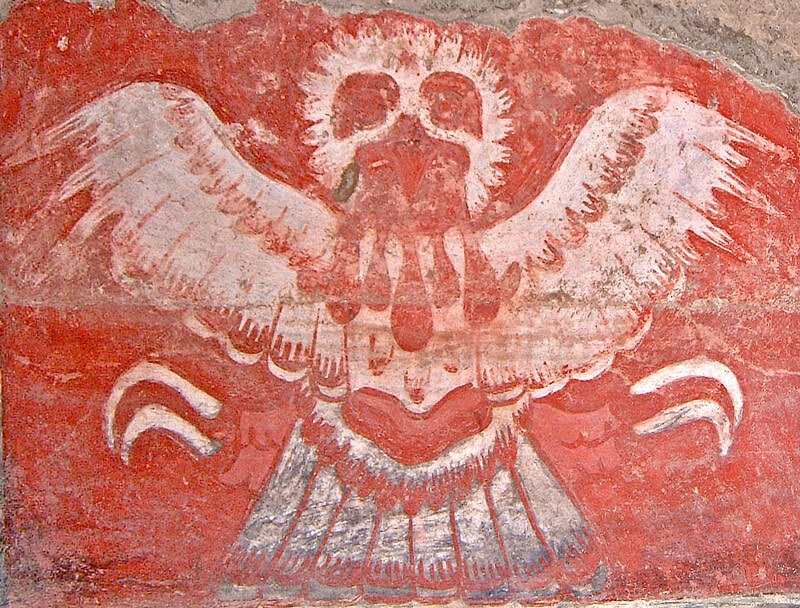 These references to the warrior-owl found at Teotihuacan support the growing certainty that Tikal was heavily influenced, if not subjugated, by the arrival of an emissary despatched from Teotihuacan, and was possibly a member of the noble family that lived within the compound of Tetitla. 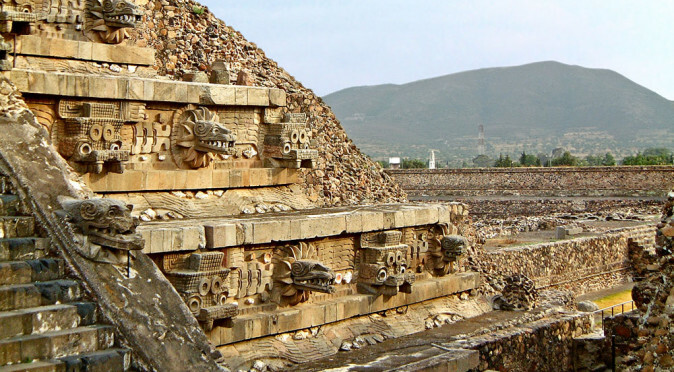 The mixture of religion, rulership, and warriorship amongst the murals of Tetitla, certainly suggests that this was the home of an elite family, or even a ruler, with its own regiment or army and its own religious obligations. 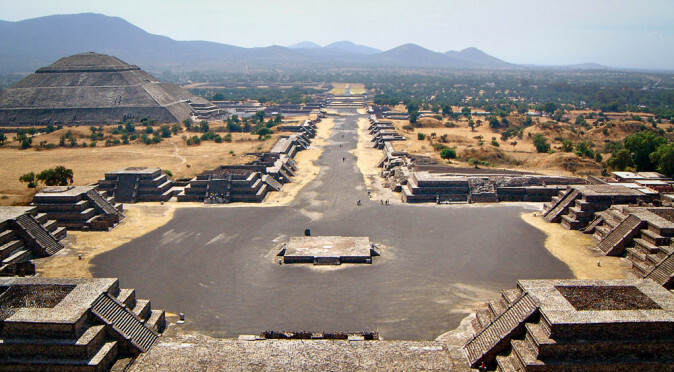 Teotihuacan played a central role in proliferating urban planning and multicultural society across Mesoamerica. 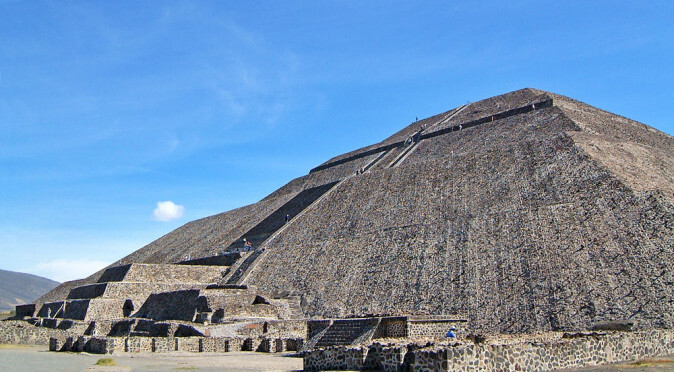 Even the Aztec, 700 years after the city had fallen, were greatly influenced by its ideologies.